Anne McClain always dreamed of flying — soaring and swooping and rocketing into space. A young McClain wrote stories about becoming a pilot. She imagined exploring the galaxy. But unlike most starry-eyed children, McClain would make it happen. Her mother, Charlotte Lamp of Spokane, says the family used to gather around the TV to watch NASA shuttle launches. 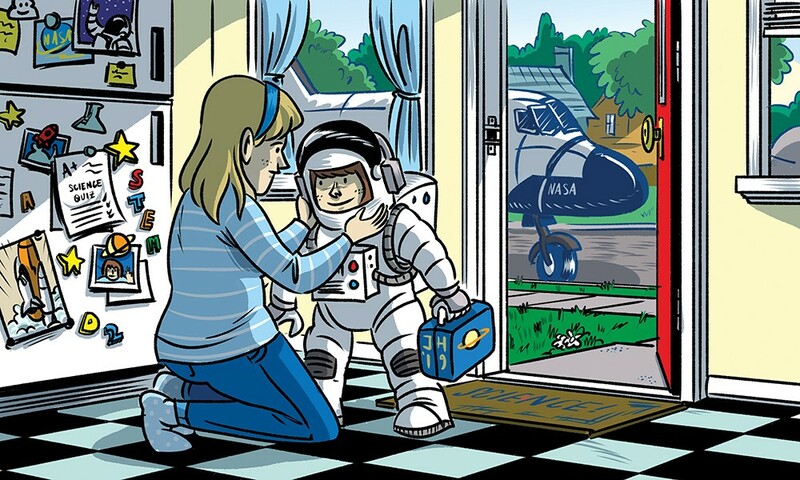 Now a retired math and science teacher, Lamp stoked her daughter's early enthusiasm for satellites and space walks. "She was adventurous," Lamp says. "The stars and the universe have always been a fascination." In what has become family legend, a 3-year-old McClain announced on her first day of preschool that she wanted to be an astronaut. She has doggedly pursued that dream ever since. As a mother, Lamp says she supported those aspirations and helped McClain embrace the challenges, but just as often Lamp found herself racing to keep up with her daughter's ambitions. McClain would graduate from the West Point military academy, earn two master's degrees in England, fly more than 800 combat hours in Iraq and attend the U.S. Naval Test Pilot School. In 2013, NASA selected her to be an astronaut candidate. So after watching McClain surpass her own high expectations time and time again, Lamp says she was surprised by a new mixture of pride and apprehension in December as she and her husband Don traveled to Kazakhstan to watch her launch into space aboard her first mission. 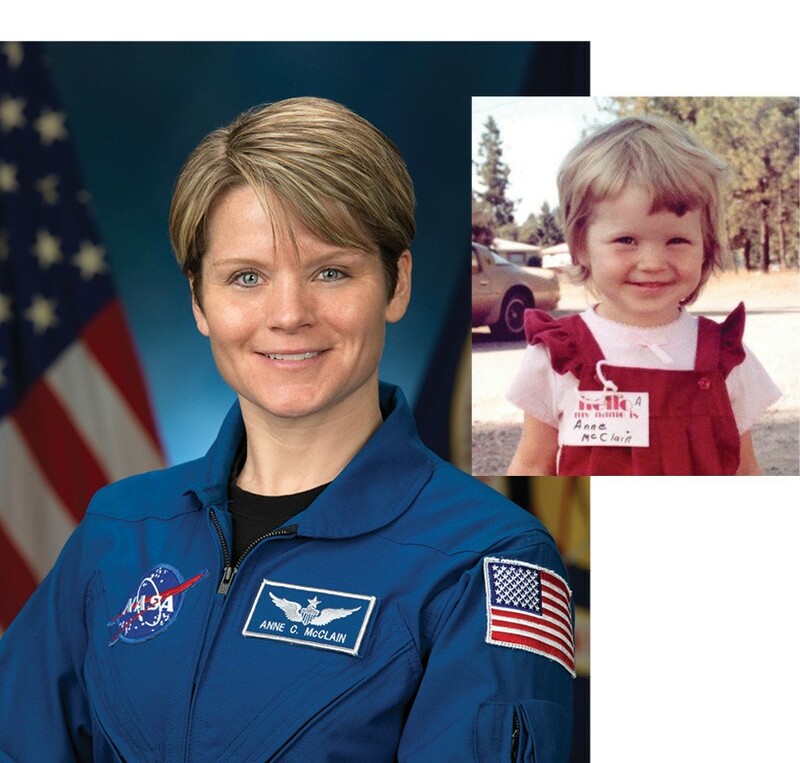 Anne McClain on her first day of preschool (right), when she announced she wanted to be an astronaut; and as a NASA astronaut. "There's not a word for the emotion that you are feeling," Lamp says. "It's kind of like the emotion of letting go." Not every child will be an astronaut, but all children have dreams that can benefit from hard work and parental support. Lamp says she tried to encourage her daughter to follow her passions and treat setbacks as opportunities for growth. Children should explore, she says, and take risks and try new things and fail and try again. "I don't like to see kids over-structured," she says. "They need to be creative." It's an attitude that many educators believe can boost student interest in science, technology, engineering and math (STEM) fields at a time when job openings continue to outpace STEM graduates. They also hope to close a longstanding gender gap in STEM professionals. Lisa White, the director of after-school programs at Spokane Public Schools, says while most children express a natural curiosity for math and science early on, studies show that interest drops off in middle and high school — especially for girls. The Washington state 2018 STEM Education Report Card states girls made up just 29 percent of students completing AP computer science classes in 2017. At the college level, women made up just 34 percent of the STEM associate's or bachelor's degrees in 2015. "You have to do more," White says. 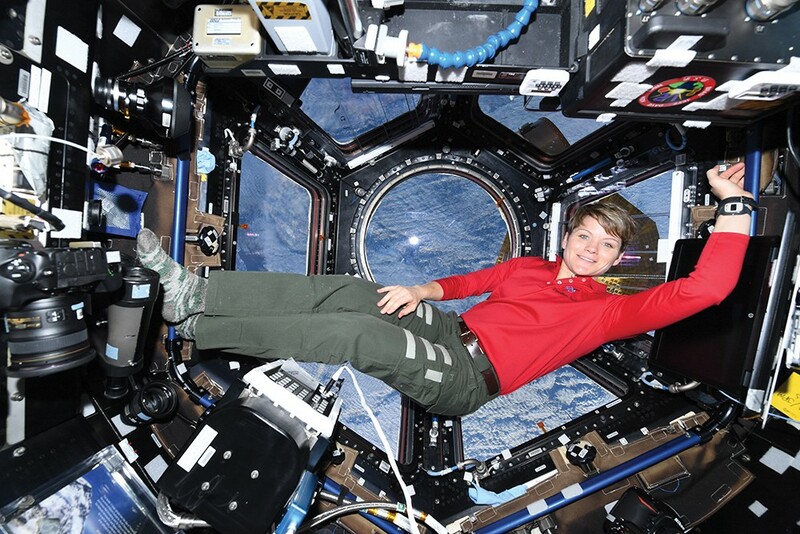 Anne McClain floats above the earth on the International Space Station. Spokane Public Schools has worked to develop robotics, computer science and biomedical programs that start at the elementary school level, she says. They want to get kids on STEM career pathways while they are young and excited about science. White says the district organizes Lego robotics teams and science summer camps to let children build and break things. They let kids experiment with coding, drones and 3D printing. One fourth-grade team is working on getting a patent. "Kids have been told, 'Don't touch that. Don't take things apart,'" White says. "They need to touch things. They need to see things go wrong." While children who struggled with math or science used to get nudged toward liberal arts, STEM educators now look for new ways to engage both boys and girls by letting them get their hands dirty. They want kids building circuits, charting stars and peering through microscopes. "The more hands-on and engaging and tactile we can make it the better," Stacy says. "Sometimes we learn to be grossed out by things as we get older." Mobius serves as a key partner for networking with Spokane STEM, local schools and libraries, Spark Central as well as the Boy Scouts and Girl Scouts. Science center marketing manager Amanda Gilliam says they focus on building "lifelong learning" habits. Nicole Adamson-Wood, with Girl Scouts of Eastern Washington and North Idaho, notes Girl Scouts started teaching STEM in 1913 with an electrician badge. She says the scout program helps compensate for many of the ways public education is still designed for boys. "They're encouraged to take risks and be leaders," she says of Girl Scouts, which builds confidence they can take back to the classroom. Surveys of young women also show a lack of role models or mentors to be a significant factor in why girls turn away from STEM. Mobius, Spokane schools and the Girl Scouts all listed efforts to showcase the success stories of female STEM professionals. And they all listed McClain as a prime inspiration. "We are all just so proud of her," Gilliam says. "We feel personally invested in her adventure." Back in the '50s, Charlotte Lamp applied for a research program at Stanford University. She says she received back a letter denying her application, explaining that as a single woman she did not seem likely to complete the program. "I wish I still had it," she says. "I'd frame it and put it on the wall." Lamp instead channeled her passion into teaching, but is relieved to see times changing to support more women in science. She says today's children, and girls especially, have access to more information and technology than ever before. Instead of watching a 10-minute news segment on a shuttle launch, a child can spend hours on the NASA website learning about astronomy and engineering. "It's so much easier now," she says. "Everything is there. It's just amazing." The best thing parents can do, Lamp says, is give children free rein to explore and experiment, to chase their fascinations and discover, to be kids and be creative and be inspired by the world around them. How do you raise an astronaut? You let them go. You can follow the progress of the International Space Station for the six-month duration of Anne McClain's journey at spotthestation.nasa.gov. 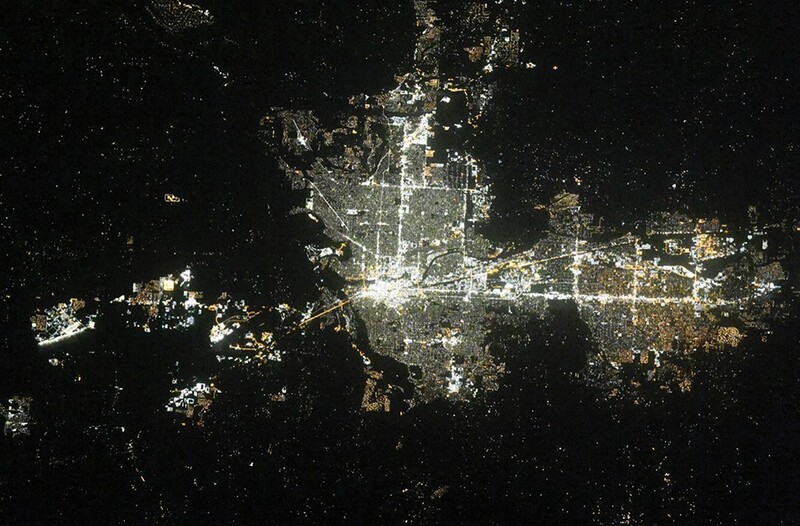 (Below) Spokane at night during a recent International Space Station flyover. Mobius Science Center: Spring break day camps let 4-8 year olds play with putty, paints and pollinators during several classes April 2-4. Find more information on these camps and other programs at: mobiusspokane.org. Spokane Public Schools: STEM & Arts Summer Camps offer classes on Lego robotics, coding, circuit building, rockets, chemistry and drone operation. The day camps run throughout July. More information at: spokaneschools.org or email summerSTEMcamps@spokaneschools.org. Girls Scouts: Day and resident camp programs feature a mixture of STEM learning, arts and outdoor exploration from June through August at Camp Four Echoes on Lake Coeur d'Alene. Children do not have to be Girl Scouts to participate. More information at: gsewni.org or email customercare@gsewniorg. Spokane County Library District: The library network offer a wide variety of STEM activities year round, ranging from forensics to biology to robotics. Find more information at: scld.org. The original print version of this article was headlined "Raising an Astronaut"